Blessings from Chile. We haven’t sent out an update since letting you all know that we were okay following the earthquake. Things have been busy and good. 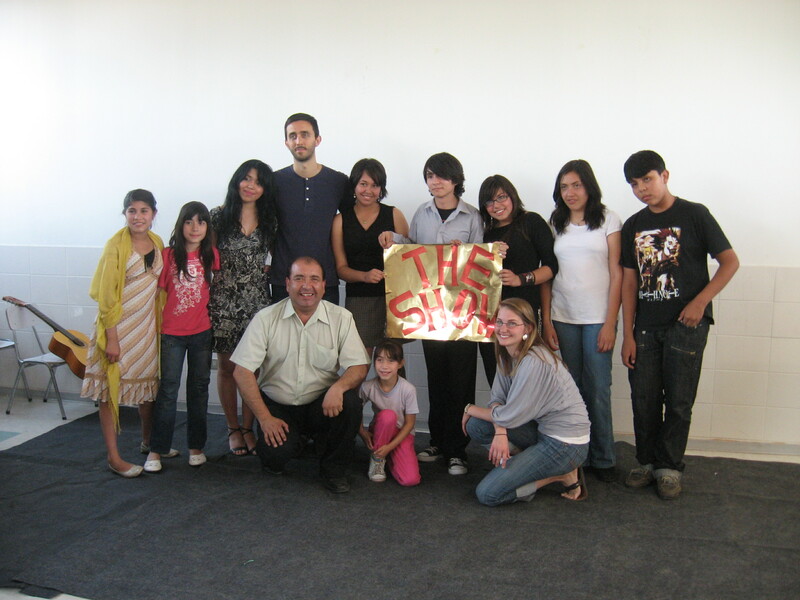 The number of things we’ve been a part of since being here in Chile seem astounding to me. We have helped in English Club in a school and another one for adults. Both English Clubs are once-a-week ministries here. We help out once in a while. English Club at the middle-school. We did a one-week youth retreat back in January that went well. Mike got to teach youths from the church some basic doctrine and Tabi filmed and photographed the retreat as well as talking to the kids about developing and using artistic abilities for the Kingdom. Seeing the youth make genuine progress was rewarding. The young people who went to Tropa 29. We also have gone through the earthquake and taken relief trips to help after the earthquake. Mike met with church leaders and missionaries and made them aware of IDES so that they could help more. Following the earthquake we have also created a Facebook page for the Christian Churches and Churches of Christ in Chile. As ongoing earthquake relief progresses, we are hoping and praying that this Facebook page can become a means by which churches and missionaries can coordinate work and resources, so that Kingdom work can be done as effectively and efficiently as possible. The earthquakes have “thrown a wrench in the works” as they say. Lots of things we had planned pretty much got put on hold for a month or more. 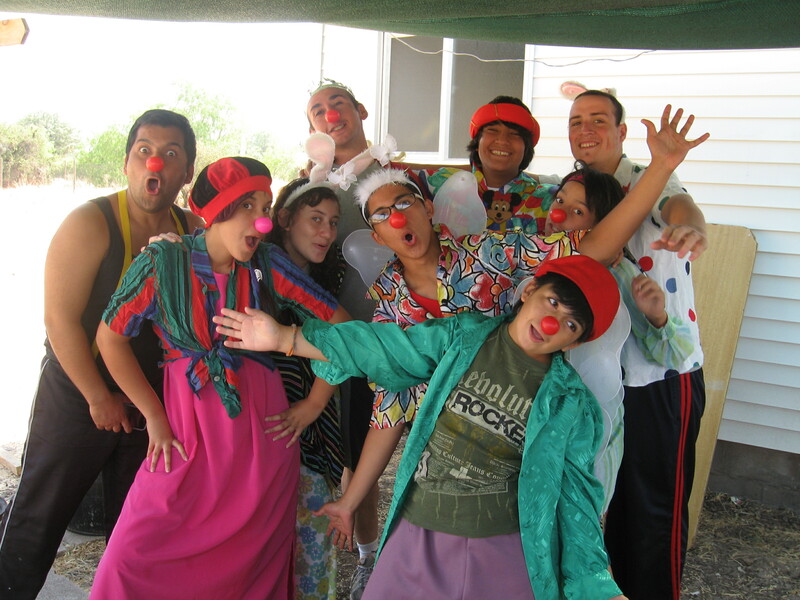 It was good that we did not have a lot of obligations yet, which left us free to help others with immediate needs. 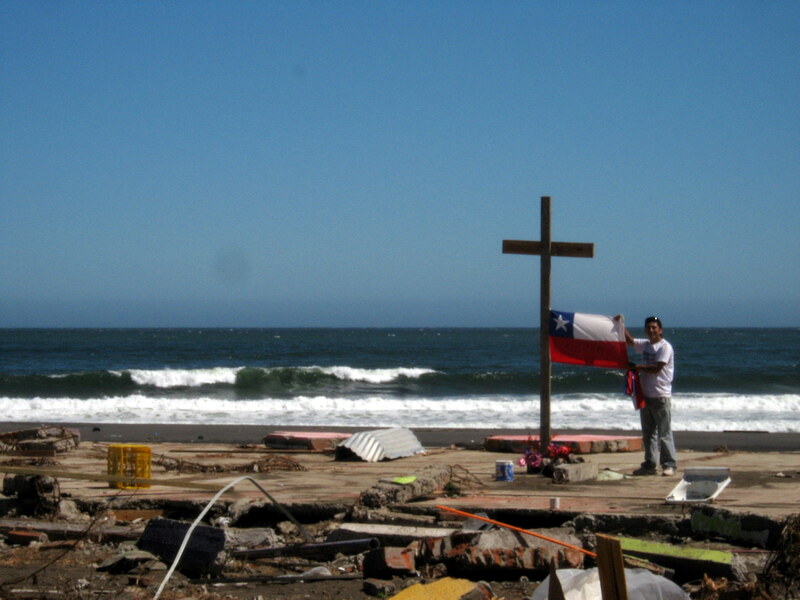 A young man holds up Chile's flag. From Mike: Unfortunately, the Bible Institute plans that I had have not materialized as planned. In fact, to the best of my knowledge the Bible Institute that I was planning on helping is nonfunctioning at this point. I am, therefore, using my gifts in other ways – still with the goal of training and equipping future church leadership, especially in the areas of Bible and Doctrine. At the moment I am planning on offering weekend seminars at Christian Churches and Churches of Christ throughout the country. This will give me the opportunity to polish my Spanish (which has been coming along quite well, I think), teach and train, as well as gaining recognition among the churches. I am hoping to build on the seminars in the future. I have been looking to plug into some work already started, but have not found any among the Restoration Movement churches yet – though my contacts are still limited. I am praying about and considering possibly starting a Bible Institute at some point in the future. Meanwhile, in the local congregation I am helping with coordination of Home Group themes, creating Sunday School lessons for the adult Sunday School and helping with the teaching, entering the preaching rotation, and participating in various other coordination efforts in the church. I am also offering to guest preach at other churches. In fact, May 16th was my first guest preaching outside of our local congregation. In addition, I am monitoring the Facebook page and trying to extend it to be an aid to unity among the churches. So far it has 90 or so “followers” from various parts of Chile. From Tabi: Although there have been some delays, I am now working with Jim Thurston (another missionary with a media studio) who will be helping to further train me to go out and start my own studio. Jim Thurston has two extensive websites, on which he posts news stories, articles, interviews, music, videos, and events. I work with him two days a week, during which time he talks to me about the logistics of setting up a media studio. His son, Paul Thurston, knows a great deal about technology. He gives me suggestions for what to buy, and what kind of equipment would be best to have. I’ve been editing a video lately. I didn’t realize how much I had forgotten from college! Fortunately, most of it is coming back to me quickly. Besides this work, I have enjoyed playing hostess to guests who come to our home, am helping teach the 5th – 7th graders at church, and have been doing odd jobs here and there in the graphic design area. I’ve been kept pretty busy, and that has been exciting and fun. I’m looking forward to what God has in store for me and for Mike. We thank God for all the prayers for us and the people here following the earthquake. What a blessing all of the encouragement that we received was! Our God is good and wise and loving and powerful. The earthquake was a good reminder of what a firm belief in our Lord Jesus Christ can do. Following the earthquake many people panicked. They no longer felt safe in their own homes. Yet, during the earthquake we knew that come what may, we had nothing to fear although we didn’t know what physical harm may come. Rather, we know that we had placed our hope in our Lord and Savior. Our sins have all been forgiven, and we can rest assured of God’s grace. What a blessing that assurance is (kind of reminds me of a hymn)! So, in the midst of so much fear, we could calmly be a light as we sat outside in the middle of the night conversing with our frightened neighbors. When we went to the earthquake zone (within 10 miles of the epicenter), we had no fear. Our lives are, as always, in God’s hands. We never have any assurance of what this life will bring, except that God will be true to any promise He has made. As He has blessed us in so many ways, including through your prayers, may He continue to bless all of you, richly.